Размер при предпросмотре: 800 × 576 пикселей. Другие разрешения: 320 × 230 пикселей | 640 × 461 пикселей | 1038 × 747 пикселей. 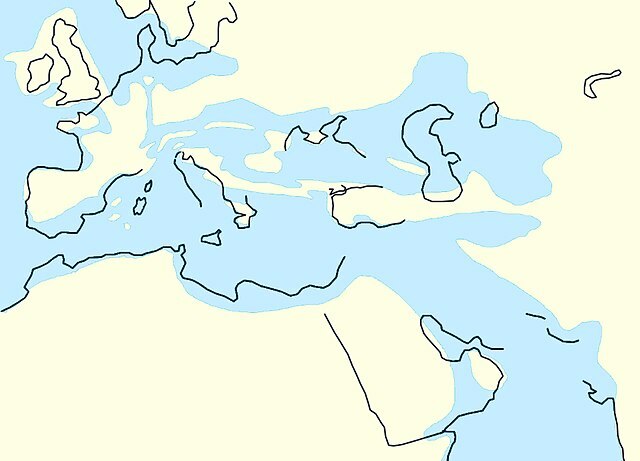 English: Paleogeography of the Mediterrenean region during the Rupelian age (33,9 - 28,4 million years ago). 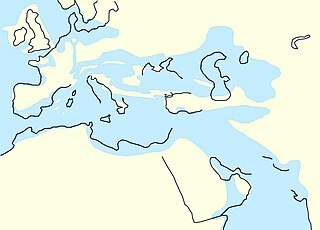 The Tethys Ocean between Africa and Europe is closing. The Paratethys gets separated from the Tethys by the formation of the Alps, Carpathians, Dinarides, Taurus and Elburz mountains (all Alpine orogeny). Rögl, F., 1999. Mediterranean and Paratethys. Facts and hypotheses of an Oligocene to Miocene paleogeography (Short Overview). Geologica Carpathica 50 (4), 339– 349. Schulz, H.-M.; Vakarcs, G. & Magyar, I.; 2005: The birth of the Paratethys during the Early Oligocene: From Tethys to an ancient Black Sea analogue?, Global and Planetary Change 49(3-4), p. 163-176.